The hotel offers multiple facilities such as cab service to the nearest bus stop, railway station and airport, free WiFi and 24 hours room service for a hassle-free stay. My airport shuttle didn't turn up but after calling them they were there within 15 minutes. They were very apologetic. Arrasuites is the best hotel near Bangalore Airport. Arra Suites Hotel & Suites is conveniently located just 8km's from Bangalore Kempegowda Airport and 10km away from yelahanka airforce station. The Arra Suites has a professionally trained and dedicated staff towards providing the best of hospitality service to our esteemed guests. 31, Vidyanagar cross, close to Decathlon Anubhava,International Airport Road, opp:Laxmi Hospital Bangalore – 562157. Traveling has become a part of everybody’s life though the purpose of travel might vary from person to person. 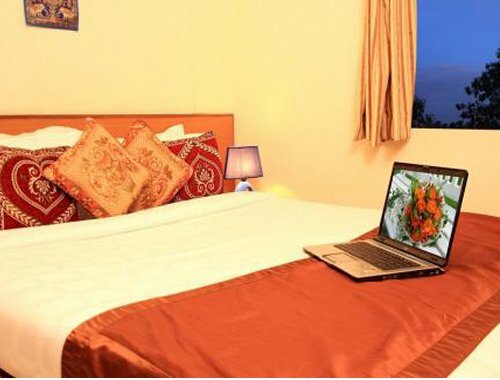 And, if you are a frequent traveler, it is always advisable to book Hotels near Bangalore Airport. Whether you are on a leisure trip, business trip, family trip or solo trip, accommodation matters a lot. As a guest, all of us would want to have a safe and comfortable trip, isn’t it? Good food and good stay along with super good memories make a trip worthwhile! If you are on a business trip, you might have to change flights or travel from one place to another. Imagine you have a very important meeting with the investors and you are stuck in traffic. Can that be a reason for you to be late for the meeting? Absolutely not! In such a scenario, it is better to save time by booking hotels near Bangalore Airport. A location plays a major role in one’s life; hence one must be wise to pick the Best Hotels near Bangalore Airport. Whether you are on a leisure trip or a business trip, it wouldn’t last for more than a week. And, you would surely not waste your precious time in traveling for meetings or commuting from one place to another. The airport is a junction to several business hotels and centers. And fortunately, most of the meetings are organized in Hotels near Bangalore Airport to ease professionals traveling from other cities. Needless to say that business trip is hectic and reduces your energy levels. If you have booked the Best Hotels near Bangalore Airport, your time and energy will be preserved. An easy schedule with a relaxed mind will keep your energy levels high and increase your productivity. As a business traveler one would always prefer to save some bucks. 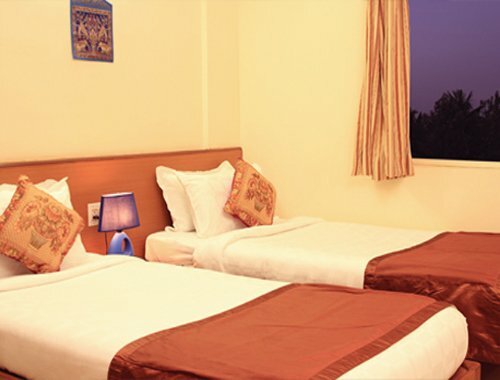 And, what better way than opting for Budget Hotels near Bangalore Airport. These hotels offer the best services at an affordable cost. Be it your concern for clean linens, sanitized washroom, Wi-Fi, Television, Mini-bar or hygienic food, Arra Suites will ensure that the needs of the guests are fulfilled. The Budget Hotels near Bangalore Airport offer competitive prices so that more and more travelers can afford a luxurious stay. You can book the Hotels near Bangalore Airport in advance to get a free pick up and drop from the airport. None of us would want to take the hassle during a business trip. Whether you have an early morning flight or a late night flight to board, if you have opted for Luxury Hotels near Bangalore Airport, you can be relieved from the stress of waking up early. Not only that, you don’t have to fight with the city traffic or be stressed about reaching the airport on time. We are just 8 kilometres away from Bangalore KempeGowda International Airport and 10 kilometres away from Yelahanka airforce station Devanahalli, Bangalore. Once you have booked the rooms, our dedicated team will be there to receive you at the airport. We offer you clean rooms, free WiFi, and 24 hours room service for a hassle-free stay. We are one amongst the Luxury Hotels near Bangalore Airport and we offer single bedroom apartments, double bedroom apartments, three bedroom apartments, Economy Non-AC single, Premium AC Single, and so on. The guests can book their choice of room and we will ensure that they never regret staying with us. Now, experience the best stay with trained and dedicated staff at Arra Suites! A hotel is a necessity these days and none of us can compromise on the amenities. No matter how good the Hotels near Bangalore Airport are, there are certain basic things that a hotel must offer to the guests, failing to which one is sure to lose the customers. The Hotel industry faces huge competition and the only way to be ahead of the competition is to offer premium services to the guests. The absolute necessity for any person after booking a room in a Hotel near Bangalore Airport is cleanliness. A good hygienic condition is necessary when it comes to the rooms, bathrooms and common areas. Irrespective of the price and size of the Hotel near Bangalore International Airport, the management should meet the basic amenities. In order to ensure a good hygiene, the place should be cleaned at frequent intervals. The Hotel Management should ensure that there is no compromise on the cleanliness part after all cleanliness is next to Godliness! The environment of the Hotel near Kempegowda International Airport must give a homely feel to the guests. This also calls for an expectation that the hoteliers take adequate safety and security measures to protect the guests from any unforeseen happenings. The security measures should be so effective that it could be personalized according to the guest profiles such as men, women, elderly, and children. In order to meet this standard, the technology and the gadgets must be used effectively. The Best Hotels near Bangalore Airport has a team that provides personal attention to the guests. We are ruled by Internet these days, aren’t we? The Internet has become a part of everyone's lives and trust us, we cannot imagine a day without it. No longer it is considered as augmented service. The guests’ expect a complementary and a dedicated Wi-Fi connection to meet all their requirements and necessities. A free, secure, and fast connection is the need of the hour and every hotel must be able to fulfil it. Whether it is day or night, a proper bedding must be offered to the guests. It should be well maintained, properly designed, qualitative, and properly cleaned. The bed should be placed in the room in such a manner that the guests should be able to move freely in the room. Sometimes guests would expect that not only a bed but, also the pillows and blanket should be clean and neatly arranged. Apart from the bed, there should be proper lighting facility, perfect dining setup, and well-ventilated rooms. These days the guests not only look for good showers or a big bathtub but, also they need a clean and spacious washroom. The concern of guest has shifted from the requirements of hot showers to the provision of better water flow from the showers, sinks, and convenient toilets with clean water that are leakage free. This also calls for the Hotel near Bangalore Domestic Airport to maintain the cleanliness of the washroom. In order to prevent the washroom from stinking, the management should use fresheners to deal with the bad odor. There could be circumstances that the guests are not convinced of certain setups of the room or there is a necessity that should be adhered to immediately. Therefore, the reception should follow the standard policy to pick up the calls in a couple of rings. In case the reception is not able to handle the situation, the call should be transferred to the concerned manager or the person-in-charge who is answerable and responsible enough to handle the situation. One of the fastest way and easiest way to get into the good books of the guest is good food and beverages. The availability of tasty food can convince the guests to ignore the small imperfections or small mistakes of the staffs and employees. This also calls for the availability of complementary food and beverages that is subjected to the Budget Hotels near Bangalore Airport. It sometimes refreshes the mood of the guests when they are served with complimentary food and good beverages on the arrival. Most of the hotels offer complimentary breakfast to the guests. A welcome drink is a must! Looking for Hotels near Bangalore International Airport? Visit https://www.arrasuites.com/ to book your stay! Whether you are on a vacation or on a business tour, entertainment is one aspect you wouldn’t want to compromise upon. The Budget Hotels near Bangalore International Airport should have a plethora of TV channels that can take care of the entertainment quotient of the guests. The other sources of entertainment are swimming pools, recreational clubs, indoor-games, Snooker, Quad-rides, and so on. There should be similar facilities for the children as well. 9) Pick-up and Drop services. In the fast-moving world, no one has the time to wait for the cab or any other transport means that could pick them up or drop them from/to the airport or railway stations. With so many luggages in-hand it becomes cumbersome to walk towards the stand to look for a cab. Thus, the guests should be provided with a stress-free journey that could be complementary or paid, subjected to the policies of Budget Hotel near Bangalore Airport. With the availability of apps and website, booking a hotel room has become very convenient. The reception desk should be available at the click of the button. The apps could easily provide a personalized check-in and check-out facilities. The technology should be convenient for every common person who is accessing these apps and website. Whether it is an app or the reception desk, the guest should not wait for a long time to check-in/check-out because time is precious for everyone and that counts the guests too. The mode of payment should be secure and integrated. Most of the hotels offer 24 hours check-in services. You can also extend your check-out timings by requesting the Hotel Management. The above-mentioned are just a few basic things that a hotel must offer to the guests. Apart from these, there are several hotels that offer premium services to the guests based on the packages that they have chosen. Of course, there are star hotels that provide the best facilities to the guests as they cater to the elite class. Having said that, India being a land of culture & tradition, ‘ATITHI DEVOBHAV’ is the belief and every hotelier is expected to follow this irrespective of the package chosen by the guests. What are the basic facilities that you looking in a hotel? Share your experience with us! Why should I Book Hotels near Bangalore Airport? In a cosmopolitan city, commuting consumes a lot of time especially from the Airport to the main city. Hence, it is always advisable to check-in to hotels nearby airport as the hotel offers multiple facilities such as cab service to the nearest bus stop, free WiFi and 24 hours room service for a hassle-free stay. .
Can I Find Budget Hotels near Bangalore Airport? Of course, there are ample Hotel near Bangalore Airport that caters to the different segments of the society. You can choose budget hotels, luxurious hotels, service apartments, and lodges based on the stay tenure and budget. Hotels near Bangalore Airport provides Airport Transfers or Not? Arra Suites Hotel & Suites offer Airport Transfers as we believe in offering services that exceed the client’s expectations. We understand the hassle of commuting from one place to another in a new city, hence, make sure that our clients’ reach safely to our Suite. Can I Get Single Bedroom Hotels near Bangalore Airport? Yes, Arra Suites Hotel & Suites offer single bedroom at an affordable price. You can also try our premium A/C single apartment if you are planning for a longer stay. The quality of the services remains the same irrespective of the rooms that the clients opt for. When is the Normal Check-In & Check-Out Timing for Hotels near Bangalore Airport? How far is your Hotel from Bangalore International Airport? Arra Suites Hotel & Suites is conveniently located just 8km's from Bangalore KempeGowda International Airport and 10km away from Yelahanka airforce station Devanahalli,Bangalore. It’s never easy to find the best hotels near Bangalore International Airport Devanahalli as there are ample hotels that claim to be the best one. As a traveler to a new city, one has to manage ample things apart from taking care of good food and accomodation. And, if you are on a business trip, you need to ensure that hotels near Kempegowda International Airport Bangalore are fully equipped with modern amenities. The service level has to be high so that professionals can focus on their professional commitments without actually having to compromise on personal life. Whether you are on a leisure trip or a business trip, location plays a vital role. If you are on a leisure trip, you need to book a hotel that is in close proximity to all the tourist destinations. If you are on a business trip to Bangalore, always prefer hotels near Bangalore International Airport as you don’t have to worry about odd flight timings and you will also save plenty of time. Contact Arra Suites if you are looking for the best hotels near Bangalore International Airport Devanahalli. The hotel offers multiple facilities such as cab service to the nearest bus stop, railway station and airport, free WiFi and 24 hours room service for a hassle-free stay. We are just 8 kilometres away from Bangalore Kempegowda International Airport and 10 kilometres away from Yelahanka airforce station Devanahalli, Bangalore. Once you have booked the rooms, our dedicated team will be there to receive you at the airport. The rooms consist of furniture, television set, air-conditioners, tea & coffee maker, glasses, water bottle, safe box, mini-bar and so on. The wake-up service is also offered by the hotel. There is a separate luggage storage room. The entire hotel is covered with high-speed internet connection. Be it park, lobby or the reception area, one can have an access to the internet connection. The complimentary breakfast is served to all the guests on all days. The food is very hygienic and the ingredients used are quality oriented. We offer you clean rooms, free WiFi, and 24 hours room service for a hassle-free stay. As a general rule, you can check-in from 14:00 on the day of arrival and must check-out at 12:00 (noon) on the day of departure. Certain hotels allow early check-in and late check-out. For exact times please contact the hotel directly. 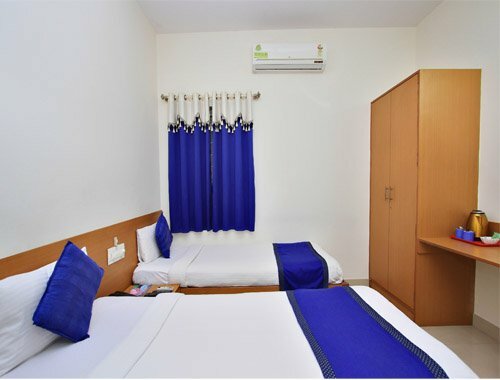 We are one amongst the budget hotels near Bangalore Airport, and we offer single bedroom apartments, double bedroom apartments, three bedroom apartments, Economy Non-AC single, Premium AC Single, and so on. The guests can book their choice of room and we will ensure that they never regret staying with us. There isn’t any additional charge for kids below two years. The extra bed will be arranged by the hotel management in advance. The rooms has a balcony where the guests can spend some quality time and ventilation issue is easily tackled. 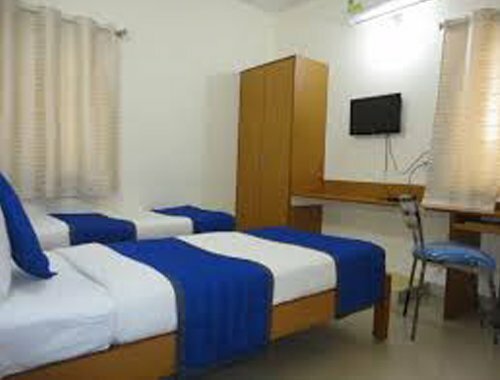 The absolute necessity for any person after booking a room in a Hotel near Bangalore Airport is cleanliness. A good hygienic condition is necessary when it comes to the rooms, bathrooms and common areas. Irrespective of the price and type of room that you have booked, we meet the basic amenities and keep our premises clean and hygienic. The environment of the Hotel near Kempegowda International Airport must give a homely feel to the guests. This also calls for an expectation that the hoteliers take adequate safety and security measures to protect the guests from any unforeseen happenings. The security measures should be so effective that it could be personalized according to the guest profiles such as men, women, elderly, and children. We abide by all the safety rules and regulations for a safe and better experience to our guests. We being in providing smooth transport services to and fro from the hotel. We have travel desk services wherein the guests can book taxis and cabs for sightseeing. The lack of accessibility of fast transportation is very annoying and it can ruin your travel experience. Thus, book a room at Arra Suites, if you are looking for the best transit hotel near Bangalore International Airport. All of us long for a budget hotel especially if we are on long tours. You can choose a hotel by comparing prices of the different hotels simultaneously and book the one that best suits your comfort and pocket. Asking discounts and other lucrative offers is not at all wrong. You are just asking for the best value for your money. You can research about the value-added services provided by hotels and check if they are worth the prices that they have quoted. You can either directly call the hotel and check the prices or check online to compare prices. There are many online deals that are worth a grab. As the travel industry is flourishing, the hotel industry is trying to make accomodation cost-effective and safe. Get in touch with us to book a value deal. We would love to serve you to the best!